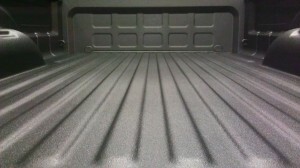 TuffGrip® is the most versatile coating formulation of Rhino. Its spray-on polyurethane formulation provides improved toughness and color stability, while retaining the non-skid grip that made Rhino Linings products legendary. It is available in 2:1 and 1:1 ratio formulations and may be applied with low or high-pressure equipment. TuffGrip has a Shore A 88 (ASTM D224) hardness with a 250% (ASTM D412) elongation rating. It has excellent impact, abrasion and corrosion resistance, and provides a high level of skid resistance, sound deadening, and vibration absorption. Its formulation is extremely flexible while maintaining its integrity under repeated flexing, regardless of film thickness. It offers a proven track record of saving businesses hundreds of thousands of dollars in equipment repair, maintenance and replacement.